Let’s face it: small kitchens are difficult to navigate. It never feels like there’s enough room for the things you need and cooking with a group can be difficult at best. When space is limited, everything requires a bit more planning to ensure smooth functioning. As you consider the problem areas in your space, you’ll probably think of your small kitchen cabinets. Cabinets are vital for storage purposes, but bulky designs and inefficient spacing can make them difficult to use. If that sounds like your cabinets, you might be tempted to rip them out and start all over. Whether you’re planning to make changes to your existing space or open to starting from scratch, we have suggestions that could work for you. At Bright Builders, we understand small kitchens and small kitchen cabinets. We’ve created this guide to help you make the most of your space. Feeling frustrated and frazzled every time you spend a few minutes in the kitchen? With a little bit of interior design magic, you can transform any space to be more reflective of your personal style. If your current cabinet complaints are mostly style-based, the simplest solution starts with a fresh coat of paint. Painting your small kitchen cabinets can have an overwhelming impact. Color subconsciously influences the way we perceive things. Lighter colors, such as whites, neutral greys, and pastels create the impression that objects are receding in space. This makes your kitchen feel bigger. On the other hand, darker and warmer colors have the opposite effect. If you’re dealing with dark cabinets that make the space feel more narrow, a fresh coat of off-white paint can instantly make your kitchen feel bigger. In fashion, we often hear certain “fashion rules.” Many warn that stripes and patterns will make you look wide, while solid colors are slimming. Although the rules aren’t the same for kitchens, the same principle applies. Vertical stripes draw the eye upward, which can make your kitchen feel taller if you have low ceilings. On the other hand, horizontal patterns, such as intricate backsplash tiling, can make the room feel wider. Just as pale, cool colors can make a space feel larger, natural and artificial light can make a world of difference. Kitchens feel tighter and more cramped when they don’t get enough light, and harsh shadows can accentuate the limits of the room. To solve this problem, consider the best way to incorporate more light into your kitchen. This can mean installing a window or changing curtains to allow more sunshine. If you’d prefer artificial light or cannot commit to adding a window, you can also explore lighting fixtures. We prefer staggered, hanging lights because they visually elongate the space. You can also consider pendant lights or chandeliers. Remember, although your light fixtures serve a practical purpose, they also present an opportunity to add a statement piece to your design. Kitchens can require a lot of attention and cleaning to keep them looking their best. Clutter accumulates quickly in small places, and the effect of that clutter is visually exaggerated by limited square footage. Uniform and consistent color schemes bring a sense of intentionality and unity to your kitchen. For example, a set of glass storage jars can transform an overflowing candy cabinet into an artfully arranged, sweet storage solution. Repetition in your kitchen design makes your choices look and feel purposeful, rather than haphazard. Interested in testing out one of the design ideas above but unsure if it will look good in your kitchen? Don’t be afraid to try new things to discover what works. For some more quick inspiration, check out the rest of our favorite small kitchen design ideas! You don’t need to go around knocking down walls to spread out your kitchen storage! Chances are, even the smallest homes have a bit of unused space, whether in the living room, bedroom, or a hall closet. Although it’s not always ideal, consider storing less frequently used items in a trunk in the living room or stashing them away in hallway cabinets. When you look around for unconventional storage options, you may be surprised by what you find! For example, with the addition of some small baskets, an empty bookcase shelf can be transformed into a new home for nonessential baking tools. Cabinet organizers, expandable helper shelves, and door organizers are invaluable additions to cramped cabinets. Organization can be time-consuming, but these tools are specifically designed to help you make the most of the available space. You can also make room on the inner cabinet shelves by installing hanging racks on the bottom of your cabinets. These racks are frequently used for wine glasses or spices, but you should feel free to improvise to meet your needs. If you’re hesitant to install racks, you can achieve a similar effect by adding a strong magnetic strip to the bottom of the cabinets. When your cabinets are already bursting at the seams, you can’t afford empty corners and crevices. In order to create more room in your cabinets, consider adding a small kitchen cart with plenty of storage options. Kitchen carts come in all shapes and sizes, so whether you need to fill space vertically or you have a bit of width to spare, you’ll be able to relocate some of your possessions from cabinet to cart. This investment is also a versatile choice because the cart can easily be pushed into the living room during parties or out to the patio for a weekend brunch. Although this suggestion can make a dent in your budget, there comes a time when you need to bring in the big guns. 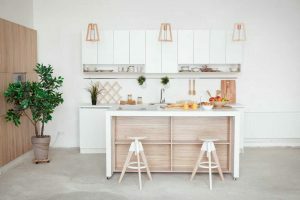 Interior designers and professional organizers have plenty of experience with small kitchens, and their advice can quickly turn a situation around. Outside opinions often bring in a fresh perspective we’d never consider ourselves. What is my highest priority for my kitchen? It’s easy to get caught up in the fun of imagining a fully remodeled space and lose sight of your priorities. Before diving into a project, consider which aspects of your small kitchen are most desperately in need of improvement. For example, if opening your center cabinet results in a cascade of pots and pans, try to address that issue first. If you don’t have the budget or time to address your most significant concerns, consider saving your remodel for a later date. Small changes that don’t impact functionality can quickly feel unsatisfying because they are essentially band-aids covering a larger problem. How much time am I willing to invest? Be realistic about your level of commitment. If you can only afford to spend a weekend or two on the project, you may be able to install cabinet organizers yourself and bring in professional help for more long-term projects. When you begin a project without a clear picture of the timeline, you may end up losing even more usable kitchen space until the project is finished. To an extent, your remodel options will be limited by your budget. Some of the suggestions above, such as painting your cabinets, could require a financial investment if you’re uncomfortable with construction work. The painting process can be time-consuming when you’re working alone, and it requires a great deal of preparation. You’ll need to remove everything in your cabinets and store it safely away from the worksite. Before painting, you’ll also remove all cabinet doors, handles, and hinges. If you’re not confident in your DIY skills, it may make sense to hire a professional painter. That expense is something you’ll want to factor into your budget. Are there any legal limitations to my remodel? If you’re considering installing new cabinetry, first establish whether or not you are legally allowed to do so. Most renters are not authorized to replace cabinets without express permission. If you’re unsure, we suggest contacting your landlord or property management company before making any changes. When it comes down to it, there’s just nothing quite like custom-built cabinetry. Customization ensures that you can make use of all available space, and you’ll be able to guide the process, so the cabinets suit your needs. It’s also an opportunity to make an intense aesthetic impact with a design that reflects your personality and individual tastes. Of course, building custom cabinetry requires a great deal of skill and hours’ worth of labor. First, you’ll work with a carpenter or contractor to create a design you love. Next, the components will be built from scratch prior to installation. This process can be costly, but it is a valuable investment in your home. We hope you’ve enjoyed our guide! Be sure to browse the rest of our blog for more small kitchen tips. Thanks for reading!